The natural habitat of many species is threatened. Summer is finally here and many are complaining about insect bites or wine flies. But even if they might be annoying in the first place, their are two very important issues about insects in our environment: First, they are endangered, because their natural habitat gets destroyed more and more every day. Second, even if we feel they are around a lot, bio mass is actually decreasing drastically. Bees aren’t the only pollinators. 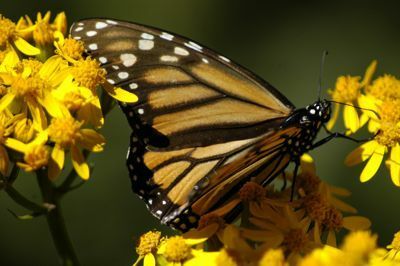 There are many other species, like monarchs, that are as important for many plants. In October 2017, the scientific magazine Plos One published an almost three-decade-long study looking at flying insect biomass all over Germany. For the past 27 years, volunteers collected data from 60 protected areas across Germany. The results were alarming. Scientist found a more than 75 percent decline in the total flying insect biomass over the 27-year period. Specific data on flying insects is hard to get. Insect populations have annual ups and downs, therefore, a survey that shows the development of a population of a year or two might not be accurate. Depending on many factors, like climate change, food situation and the interaction with other species, declines or increases can be normal. To get funding for a 27-years study about insects with not more than a suspicion is hard. That makes the data of this one more valuable and even biologists in Ohio are familiar with the results and alarmed at the same time. Situation for insects in the U.S. The focus of the German study is the decline of the biomass of flying insects which is an important distinction compared to just counting the number of insects in an ecosystem. People underestimate how many insects there are out in the environment because you don’t see them all, as the biologist explained. They serve an important role in the ecosystem, as they are on the meal plan for many other animals. Insects serve many different roles in our ecosystem. They are a vital part of an ecosystem’s food chain, serve as pollinators for plants, and help clean up the decomposing material of an ecosystem So, a decline of the insect biomass can ripple through an ecosystem, causing significant changes. Dr. Kelly Johnson has an idea of the worst-case scenario of the progressing decline of the biomass. Their interaction with the ecosystem is also important for most other plants. And on top, they are the natural recyclers for organic waste. Insects aren’t just important because they are food for other animals but because they help provide food for humans too. Some species are so-called pollinators — helping with the propagation of plants by seed dispersal or pollination. According to Johnson, pollinators play a role in producing 2/3 of our produce. In California, two million honey bee colonies are transported to the state every season to pollinate the flowers of almond trees. Dr. Reed Johnson, assistant professor in the Department of Entomology at Ohio University studies bees and agriculture. He says the human/bee relationship is in the process of evolving into something even more interdependent. But Ohio University’s Dr. Kathy Johnson says wild pollinators will always be vital. There is a quote often attributed to Albert Einstein, “If the bee disappeared off the face of the earth, man would only have four years left to live.” Even if Einstein wasn’t the one saying it, the idea behind it is still accurate. So what would we do if the natural occurrence of pollinators isn’t enough anymore to pollinate all of our fields? In China, farmers are turning to people to do the job of pollinators. To hand-pollinate, humans have to take a small brush and move the pollen from flower to flower. In comparison, a single bee can visit up to 5,000 flowers every day. Bees aren’t the only pollinator species affected by a decline of the population. Monarch butterflies can be found all over the United States. The butterflies live up in the north in summer and travel down to a certain area in Mexico in winter. There is almost no region in the United States where monarchs do not travel along at least once on their journey. Scientists know a lot about the monarchs’ journey through the practice of tagging. Developed by Canadian scientist Dr. Fred Urquhart, the practice led to the discovery of the monarchs’ overwintering site in Mexico in 1976. Dr. Urquhart and his wife Norah couldn’t have made the discovery if it wasn’t for the help of hundreds of citizen scientists across the country who would tag butterflies as part of the Insect Migration Association, which the Urquharts founded. 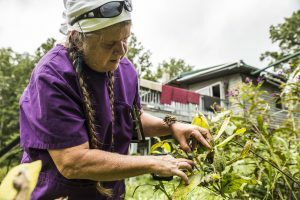 The organization has since evolved into Monarch Watch, which still hands out kits for residents to catch single monarchs and attach a tag to their wing. Whenever they get caught again, the information on each tag will tell where they come from and when they started. Monarch butterflies make a great journey each winter. 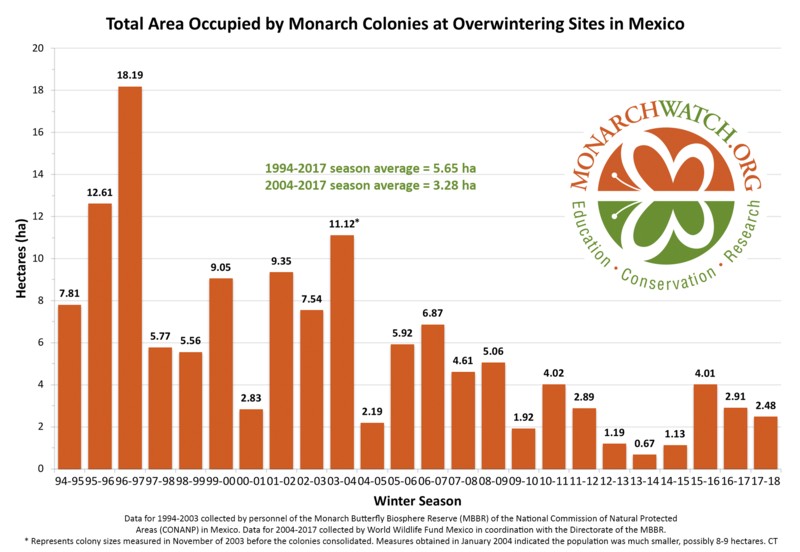 Somehow every monarch east of the Rocky Mountains knows the way to what is now the Monarch Butterfly Biosphere Reserve in Mexico. UNESCO declared it a World Heritage Site in 2008. But since the mid 1990’s the monarch population has been on the decline. A graphic on monarchwatch.com shows, that the population suffers from smaller ups and downs every year, but a static decline since 1996 is obvious. The data is not based on actual numbers of single animals, but on hectares occupied by the population in Mexico. 18,9 hectares were occupied in winter 1996/97. That is equal the size of 19 full baseball fields. In winter 2013/14 there weren’t enough monarchs to cover the size of one baseball field. There are many factors contributing to the decline of the population, but the biggest is the loss of habitat. The monarchs are dependent on milkweed and with a reduction of milkweed on their way south, monarchs lose their most important resource for survival. Due to modern ways of agriculture, natural milkweed plants get rare. The decline in the monarch butterfly population and the results of the German study are signs of trouble when it comes to insect biomass and that could spell trouble for the planet. Insects play an important role when it comes to agriculture. We must fight against habitat loss, the use of insecticides that are harmful to pollinators, and rethink the need for aesthetically perfect fruits. Pollinators are in danger and with that, so are we.